A straightforward imaging method that eliminates the need for fluorescent labels may soon be available. The new approach developed by Yokohama University researchers could be used to detect DNA or proteins related to cancer by measuring changes in the laser’s wavelength and gauging its intensity when molecules are adsorbed in the system. Label-free biosensing is a highly active area of medical research, largely because labeling molecules are so expensive. Typically molecules of interest are functionalized, or chemically bonded to a fluorescent label, so they can be seen when exposed to certain light stimuli. 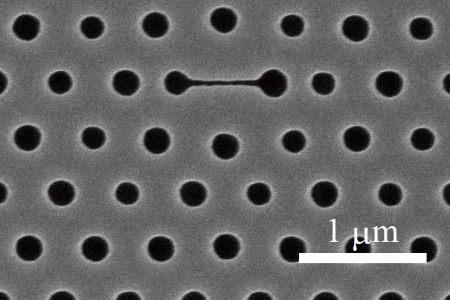 Getting away from these expensive molecules has been the goal of many research teams that have looked at resonance optical cavities, or plasmonic states. Unfortunately, these methods can also be expensive, as they require specialized equipment like spectroscopes. Recently, after a somewhat serendipitous discovery, researchers developed a laser-based approach that may provide a new alternative, according to a recent press release from the American Institute of Physics. Having built a photonic crystal nanolaser, the team coated it with a thin zirconium dioxide layer to protect it in solutions. After coating it, the team placed the laser in solutions containing various pH levels and polymer concentrations. What became quickly apparent to the team, however, was that the intensity of the laser changed with adsorption of the polymer molecules, a feature that would allow testing of surface charges on the molecules. Changes in the laser’s intensity are caused by an alteration in the redox potential on the surface of the instrument, according to a recent study published by the team in Applied Physics Letters. How electrons fill the surface is changed by pH, and by the molecules that are adsorbed, which alters the performance of the laser and its emission efficiency. So, in addition to refractive index changes that may be detected by variations in the wavelength of the laser, the change in intensity gives an indication of the electric charges at work in the vicinity of the instrument. The team has already demonstrated that the device can detect DNA in solution, according to the press release. Using the intensity change approach, they hope to apply the method to detecting cancer biomarkers, or biomarkers for other diseases. With the introduction of graphene, approaches to highly acute biosensing have been attempted in the materials science space as well. Recently, a graphene biosensor was designed that detects very-low levels of DNA due to an increased sensitivity of the sensor that was bestowed by graphene’s geometry.